With one of the longest left breaks in the northern hemisphere, surfing is perhaps the most classically renowned activity that Punta Banco and the Pavones area offers. The area also boasts 275 species of birds as well as innumerable varieties of butterflies, including the famed 'Blue Morpho'. Three species of monkies thrive at Sotavento, two of which are endangered; Mantled Howler Monkeys (endangered), Central American Squirrel Monkey or Titi (endangered) and the White-throated Copuchik or White Face. Sotavento means Leewerd Wind in Portuguese, and is the dominant morning breeze, which at Punta Banco is leeward, i.e. offshore. 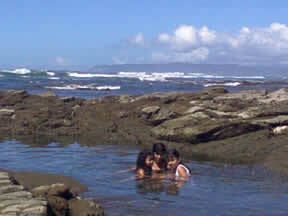 Low tide marks the opportunity to make it around "the rock" (Punta Banco), to explore the beaches to the south. Take a guided horseback tour either on the beach or in the forest. Stop along the way to swim in the gulf or in the river. Be sure to bring sun screen. 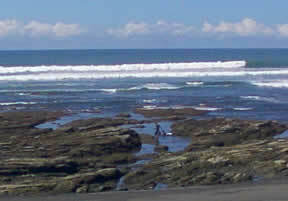 The rocky coastline boasts a wealth of life in the tidal pools that are exposed at low tide. Swim in the quiet pools of water, or beachcomb miles of abandoned beaches. Gaze across the Golfo Dulce, the 10th deepest gulf in the world, to consider the Osa Peninsula on the other side and the open Pacific Ocean to the south of Cape Matapalo. At Sotavento, we like to throw a party every once in awhile as well. 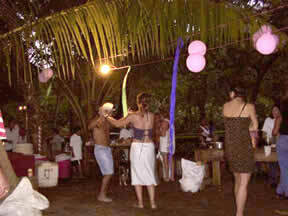 This was our New Year's Eve bash on the beach, Punta Banco style, to bring in 2001. 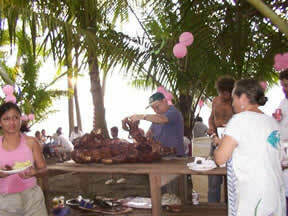 Top Left: reggae nights, Bottom Left: pig on a spit, Top Right: dinner is served. 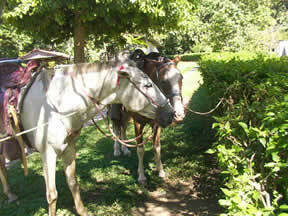 Careta y Nieve (Below) are ready to take you riding (for a modest fee) at your convenience. 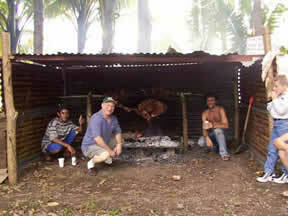 The Guaymí have a reservation in the mountains to the southeast of Punta Banco. Travel on horseback to their village and experience a way of life that reaches back to an age of hemispheric innocence, before the arrival of the European colonizers. Not far away yoga classes are offered. Finally, we can set you up with local sport fishing trips (marlin, sailfish, dorado, snook, roosterfish, etc. 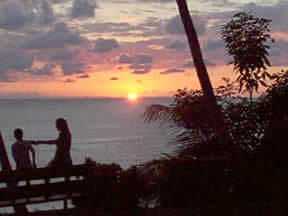 ), and walking tours in primary and secondary tropical rain forest. Under the Leeward Wind, you only grow bored if you choose to.